← Did Hawking Say “There Are No Black Holes”? My post about what Hawking is and isn’t saying about black holes got a lot of readers, but also some criticism for having come across as too harsh on what Hawking has and hasn’t done. Looking back, I think there’s some merit in the criticism, so let me try to address it and flesh out one of the important issues. Ok. One of the points I made on Thursday is that there’s a big difference between what Hawking has written in his latest paper and a something a physicist would call a theory, like the Theory of Special Relativity or Quantum Field Theory or String Theory. A theory may or may not apply to nature; it may or may not be validated by experiments; but it’s not a theory without some precise equations. Hawking’s paper is two pages long and contains no equations. I made a big deal about this, because I was trying to make a more general point (having nothing to do with Hawking or his proposal) about what qualifies as a theory in physics, and what doesn’t. We have very high standards in this field, higher than the public sometimes realizes. A reasonable person could (and some did) point out that given Hawking’s extreme physical disability, a short equation-less paper is not to be judged harshly, since typing is a royal pain if you can’t even move. I accept the criticism that I was insensitive to this way of reading my post… and indeed I thereby obscured the point I was trying to make. I should have been more deliberate in my writing, and emphasized that there are many levels of discussions about science, ranging across cocktail party conversation, wild speculation over a beer, a serious scientific proposal, and a concrete scientific theory. The way I phrased things obscured the fact that Hawking’s proposal, though short of a theory, still represents serious science. But independent of Hawking’s necessarily terse style, it remains the case that his scientific proposal, though based on certain points that are precise and clear, is quite vague on other points… and there are no equations to back them up. Of course that doesn’t mean the proposal is wrong! And a vague proposal can have real scientific merit, since it can propel research in the right direction. Other vague proposals (such as Einstein’s idea that “space and time must be curved”) have sometimes led, after months or years, to concrete theories (Einstein’s equations of “General Relativity”, his theory of gravity.) But many sensible-sounding vague proposals (such as “maybe the cosmological is zero because of an unknown symmetry”) lead nowhere, or even lead us astray. And the reason we should be so sensitive to this point is that the weakness of a vague proposal has already been dramatically demonstrated in this very context. The recent flurry of activity concerning the fundamental quantum properties of black holes (which unfortunately, unlike their astrophysical properties, are not currently measurable) arose from the so-called firewall problem. And that problem emerged, in a 2012 paper by Almheri, Marolf, Polchinski and Sully (AMPS, for short), from an attempt to put concrete equations behind a twenty-year-old proposal called “complementarity”, due mainly to Susskind, Thoracius and Uglom; see also Stephens, ‘t Hooft and Whiting. As a black hole forms and grows, and then evaporates, where is the information about how it formed? And is that information lost, copied, or retained? (Only if it is retained, and not lost or copied, can standard quantum theory describe a black hole.) Complementarity is the notion that the answer depends on the point of view of the observer who’s asking the question. Observers who fall into the black hole think (and measure!) that the information is deep inside. Observers who remain outside the black hole think (and measure!) that the information remains just outside, and is eventually carried off by the Hawking radiation by which the black hole evaporates. And both are right! Neither sees the information lost or copied, and thus quantum theory survives. For this apparently contradictory situation to be possible, there are certain requirements that must be true. Remarkably, a number of these have been shown to be true (at least in special circumstances)! But as of 2012, some others still had not been shown. In short, the proposal, though fairly well-grounded, remained a bit vague about some details. And that vagueness was the Achilles heel that, after 20 years, brought it down. So while I understand that Hawking isn’t going to write out long equations unless he’s working with collaborators (which he often does), even the simplest quantitative issues concerning his proposal are not yet discussed or worked out. For instance, what is (even roughly) the time scale over which information begins leaking out? How long does the apparent horizon last? It would be fine if Hawking, working this out in his head, stated the answers without proof, but we need to know the answers he has in mind if we’re to seriously judge the proposal. It’s very far from obvious that any proposal along the lines that Hawking is suggesting (and others that people with similar views have advanced) would actually solve the information paradox without creating other serious problems. When regarding a puzzle so thorny and subtle as the black hole information paradox, which has resisted solution for forty years, physicists know they should not rely solely on words and logical reasoning, no matter how brilliant the person who originates them. Progress in this area of theoretical research has occurred, and consensus (even partial) has only emerged, when there was both a conceptual and a calculational advance. Hawking’s old papers on singularities (with Penrose) and on black hole evaporation are classic examples; so is the AMPS paper. If anyone, whether Hawking or someone else, can put equations behind Hawking’s proposal that there are no real event horizons and that information is redistributed via a process involving (non-quantum) chaos, then — great! — the proposal can be properly evaluated and its internal consistency can be checked. Until then, it’s far too early to say that Hawking’s proposal represents a scientific theory. This entry was posted in Astronomy, Quantum Gravity, The Scientific Process and tagged astronomy, black holes, Hawking, QuantumGravity. Bookmark the permalink. I agree with the idea of having the proper amount of sensibility towards the predicament that his cronic illness exerts on Hawking’s life, including how much more difficult it is for him to do science. But having said that, I also think that it is very important that we all must realize that for the scientific process to be conducted in a “squeaky clean” manner, it cannot allow for any particular prerrogatives to anything or anyone. Hawking is physically ill; intellectually he is a force to be reckoned with, and needs no special treatment. He knows perfectly well that his proposal is a skeleton and lacks flesh. In a way, this issue started in 1974 when Hawking first proposed his idea of a black hole evaporating into thin air and leaving no trace of its history and its data, in clear contradiction with Shannon’s information theory, which was immediately pointed out by both t’ Hooft and Susskind, which are also, each one of them, an intellectual power to be reckoned with. But this is a very large issue, so other guys, like the AMPS collaboration, or Maldacena and Susskind, just to name a few, have presented proposals that have added more meat and spices to this stew. BTW, this is an issue that only experts can argue about, so, I declare myself just an interested spectator of the show. Hi Matt: Let us hope that Hawking will be reasonably comfortable in near future. So he and his collaborators can put equations in their papers. Under the circumstances, he has done more for fundamental physics than anyone I can think of. One question: In reply to my question in previous blog, you said “For Hawking’s proposal to make sense, I believe there could be no singularities associated with black holes.” But in absence of any event horizon for at least sometime, how would he slow down the Hawking radiation emission. We have seen matter falling in but not coming out. So the emission process has to be slow (may be only QM tunneling) .Then astronomical BH would take billions of years to evaporate. So it must be that the event horizon is present when the BH is formed and then slowly, may be over billions of years, it disappears. Of course the mechanism may be very weird and it would not solve the information paradox. What do you think? I assume that Hawking is not suggesting that his original calculation of black hole radiation is dramatically wrong. In his original calculation, a black hole with the mass of the moon (and thus the size of a millimeter? I forget — very tiny) would last for billions of years. A black hole with the mass of a star would last for an immense length of time, while one significantly smaller than the moon would explode after a short time. This will presumably not change … and I presume, therefore, than an apparent horizon will last for something like this length of time. The problem is that I believe that the information has to start slowly leaking out much earlier, or I think the firewall problem comes right back. But there’s no way to test that idea experimentally; it will have to be done by demanding theoretical (i.e. conceptual and mathematical) consistency. ” it will have to be done by demanding theoretical (i.e. conceptual and mathematical) consistency”, indeed, I think in line with what I have mentioned: mostly out of first principles or ab initio. As I have already stated, I’m just an informed reader of this subject and certainly not an expert, so, take my comments with a grain of salt. Black holes are among the few components of our universe where we just can’t say that its behaviour is mostly classical, so just we can’t ignore quantum mechanical effects and just use General Relativity to study them: we have to consider both GR and Quantum Field Theories (a few of them, and not just one single QFT in particular) to have a realistic physical-mathematical description of their behaviour. It has proven increadibly difficult to find a balanced integration of GR with QFTs into a single and successful theory of quantum gravity or whatever we may call it. It has also been really difficult to develop solid science without controversy about black holes, and there are similar issues with much simpler stuff pertaining to black holes, like say, the so called No-Hair Conjecture. But we should also take into consideration the importance of this theory, as we have been able to predict the existence of black holes just out of first principles, even if the theory is still a work in progress, and then, we had experimental astrophysicists designing and conducting experiments to scan for the indirect and incontrovertible evidence (as much incontrovertible as it can be attained, at least) of their existence. Now we have some solid evidence that galaxies coalesce around super-massive black holes. Scientists have been able to compile different types of evidence from the behaviour of galaxies under different conditions and all this evidence points towards confirming the existence of black holes. For instance, when to galaxies approach each other and “crash”. After that, the shapes of both galaxies get twisted or warped, due to the gravitational influence on each other. The dance that both galaxies engage in can only be properly explained if there is a massive black hole at the center of each of these galaxies. There are many galaxies like our own that exhibit a funny behaviour of the stars that are close to the center of these galaxies: these stars spin like crazy around a “blind” or “empty” spot, buzzing around that spot at incredible speeds. The only proper explanation for this behaviour is that at the “blind” spot lies a massive black hole. As much as we have had successes out of this theory, we also have some real conundrums. I think no one who has any interest in physics can avoid being a great admirer of Hawking, his accomplishments would be impressive for someone not afflicted with such a terrible debilitating disease. But I am very skeptical of Hawking’s proposal and frankly any proposal which postulates that somehow the information “lost” in a black hole returns is some form in the Hawking radiation. I would like to offer my opinion, for what’s it worth, ( perhaps not too much) on the thorny black hole information conundrum. I think it must be , at least in some sense , that information is not destroyed by black hole evolution. The Ads/CFT correspondence requires this to be the case, though we should not lose sight of how restricted the conditions are for this duality between surface and bulk degrees of freedom in this Holographic proposal. There are several proposals that are thought to conserve information which allow the Hawking radiation to remain a pure black body spectrum as predicted by the semi classical formalism, therefore being of the same character as Unruh radiation which is related to Hawking radiation by the equivalence principle. These are the planck remnant , baby universe and future and past correlations of decoherent histories proposals. The planck remnant proposal is at odds with the Bekenstein bound, the baby universe proposal is in some tension with general relativity, and the future and past correlations contradicts our intuition of how things evolve with time. But I think the last two are the lesser of several evils. One extremely speculative idea that I would like to offer is a combination of the baby universe and past and future correlation proposals. Therefore if Aguirre and Gratton are correct, there would time reversed bubble nucleations whose arrows of time would point away from the null boundary. Again assuming all this is correct , it would be a mathematical certainty that every possible history has an exact time reversed correlate across the null boundary. For any given history with black holes, there would exist an exact time reversed version ( a white hole) across the null boundary. From the quantum perspective, we would have black hole – white hole entanglement. Information entering a black hole would be lost to any possible observer, who can only exist on one side of the null boundary, but globally information would be conserved , as it is in the baby universe proposal. However, this would require a substantial modification of our understanding of gravity, and it’s not clear that this conforms to the Ads/CFT correspondence. Proposals, proposals. Lots and lots of proposals. If I’m not mistaken, the main idea behind Hawking’s new proposal is that since the firewall paradox happens at the even horizon and since we do not see firewalls ignating out of black holes in real life (in our universe), there must be a flaw in the idea of the event horizon itself, and since Hawking’s argument (without equations to prove it) is that we can still think of a workable black hole theory without the concept of the event horizon, then, let’s get rid of the event horizon. I can’t argue in favor or against this “let’s trash the event horizon thang” (I don’t know how to do that), we could agree on the fact that the event horizon concept smells a lot like the Divergence Theorem of classical vector fields. No, that’s not what Hawking is saying. First, we do not know, experimentally, if there is a firewall or not. That’s something you can only find out by trying to fall into a black hole yourself, or perhaps through subtle effects that we certainly can’t measure on any astrophysical black hole today. The problem with a firewall is that it flies in the face of the statement of general relativity about black hole horizons — that a person passing through a horizon will not feel anything different, and that a horizon is just a surface of no-return, with nothing actually there. The problem is the information paradox, which I haven’t explained yet. It’s not an experimental issue; it’s a mathematical-/theoretical-consistency issue. In brief, Hawking is trying to figure out how to maintain quantum theory in the context of black holes, that’s all he’s doing. Event horizons of evaporating black holes have long been known to be a serious challenge to quantum theory, but all the evidence from other sources is that quantum theory can describe black holes successfully… so there’s a paradox. Hawking (and many others) are trying to resolve it. My simple-minded understanding of Hawking radiation from a BH, arises when a pair of virtual particles forms near the outside edge of the event horizon — one falls in, the other escapes as a “real” particle. But IIRC from one of your older posts, virtual particles are not really “particles” at all, they are some kind of “disturbance” in the quantum field for that type of particle. So how how does one “disturbance” get into the inside of a BH horizon, and the other “disturbance” turn into a “real” particle (or quanta of the field) ? And how does Hawking radiation work, or the implications for the “firewall”, if it’s one of those “naked singularities” that supposedly don’t have a horizon? @TomH, besides that, once the pair of virtual particles split at the event horizon (one is swallowed by the black hole, the other shines as Hawking radiation) they both become real particles. As they become real particles there is no issue. IMHO Tom’s question is pertinent, Matt. The given explanation for Hawking radiation is unsatisfactory. Virtual particles aren’t vacuum fluctuations, there are no negative-energy particles, you could use the same logic to say the black hole consumed spatial energy and grew bigger, etc. I can’t find any “explain it to your grandmother description” that makes sense to me. And I can’t find anything that gets round the infinite gravitational time dilation either. In your last blog you replied saying “For a quantum black hole that is created and then evaporates away, your statement is false”. I’m afraid that doesn’t help much. Maybe you could write a blog article explaining how Hawking radiation works? If you have already or if you can link to a nice description, apologies in advance. @duffieldjohn: as I understand what you are pointing at, your doubts are similar to the ones presented by Susskind and others regarding Hawking’s proposal of how Hawking radiation works with the “evaporation” of black holes over time. Susskind himself has said that other theorists have not been able to find a flaw in Hawking’s equations and demostrations, but the end result is not consistent with other principles of physics, so, there is a clear contradiction hiding somewhere. It’s not easy to explain to your grandmother, but I’ll think about how to do it. In the end, let’s not forget that the reason Hawking is famous is that this was a difficult and not-obvious calculation, and yet he did it. The fact that this disturbance turns into a particle going out and a particle going in is the main content of Hawking’s 1974-1975 work. It’s not obvious at all. It has in part to do with how these disturbances are viewed by accelerating observers, but it’s even more subtle than that. All of this is far beyond the scope of my articles on virtual particles. Yep, I understand how the firewall paradox does not seat well with General Relativity: all observers, no matter how they are moving and were they are standing, should experiment the same laws of physics and the equations of these laws of physics should have the same general shape to all these observers. There is a contradiction between this principle (covariance) and the firewall that some theories predict for an observer passing through the event horizon while falling into the black hole. Besides this firewall contradiction, it is the Information Paradox, which is a part of the original proposal of Hawking (the essence behind the famous “Black Hole Wars”), and this is also an unsolved issue, and so it seems that these two issued are intertwined. Gauge/gravity is a toolset, and it may be that like other toolsets it is only reliable in some low-energy/low-curvature limit, along the lines of many other toolsets that successfully form the bases of various physical theories. AdS/CFT, a particular gauge/gravity correspondence, has its uses in shifting calculation problems around, but is properly a formalism rather than a physical theory. Real compact massive objects (and the real universe at cosmological scales) are neither sufficiently dominated by gravitational collapse that they are properly AdS-like nor are they invariant under conformal transformations. I don’t think it is really clear to anyone — even Polchinski — that AdS/CFT is properly useful for extracting the relevant equations-of-state. However, there is also no reason to abandon AdS/CFT or gauge/gravity generally, since it might be useful in other ways. However, the time reversed version is not really so simple: an isolated black hole interacting almost exclusively with the CMB [say, an ejected star of sufficient mass that it evolves into a black hole in our conventional direction of time] has some very vigorous evaporation at both boundaries in both directions, with the direction of the arrow of time mainly determining whether the long process is cooling to the CMB temperature or heating to the CMB temperature; initial evaporation happens after thermalization. The picture is much messier for stellar black holes embedded in larger structures, and messier still for SMBHs in AGNs. Is the DM equation of state important in those settings? ICS sure is relevant near such objects, and thinking about ICS under time-reversal ought to give you headaches. What happens to a very lucky proton that manages to survive in a (meta)stable orbit that takes it very close to where the photon rings are in the video above? Approaching the limit of the innermost photon rings of an accretion disk, would such a proton “observer” notice any differences in its own properties (such as quark number)? What are the determinants? Do Fulling, Davies, Unruh and Gibbons-Hawking matter to that type of observer? Should there be a democratization of event horizons as there is for causal cones? Is an event horizon ever sharp enough that a lucky orbiting proton could straddle it? If not, what forbids that? Or, at the level of the AMPS can of worms, if an entangled pair straddles the event horizon, what happens to the correlation, and what happens to the entanglement energy? Does it end up in a firewall, or in the gravitational field (http://www.preposterousuniverse.com/blog/2010/02/22/energy-is-not-conserved/), does it leak out eventually, or is it carried out by non-local interactions (EPR=ER) ? As suggested in the blog post, intuition and thought experiments involving simplified systems and/or time reversal often run into inconsistencies and unphysical predictions when one writes them down formally and explores the consequences rigorously, and practically everyone agrees that the best tools for such formal explorations are mathematical equations. In “radiation”, absorption and emission are two inseparable equivalent identities of the same physical essence. The thing about photons is that they redshift, losing energy as space expands. If we keep track of a certain fixed number of photons, the number stays constant while the energy per photon decreases, so the total energy decreases. Since both energy density and pressure contribute to the strength of gravity in General Relativity, RADIATION is composed of massless or nearly massless particles that move at the speed of light. Known examples include PHOTONS (light) and neutrinos. This form of matter is characterized by having a large POSITIVE PRESSURE. Energy isn’t conserved; it changes because spacetime does ? If photon energy is not conserved, momentum also not conserved – then speed of light “c” wil change – but it is a constant. What is the source of radiation for constant photon speed ? Much improved over your previous post! Looking forward to your tutorial. Nothing “brought down” complementarity yet. Rather, a some experts are confused about some vague arguments such as the ones appearing in AMPS. Other experts have suggested IMHO much more convincing reasons about why these arguments are flawed. These last 3 papers use sensible models of quantum gravity and offer hard computational evidence to support their claims, unlike AMPS. Uh huh. If it were that easy, why doesn’t Hawking already agree with you on this point? Or Susskind? or Bousso? I would like to know. All I can say is that having followed the literature, the rebuttals look much more convincing than the papers claiming there is a problem, even if they are generally authored by younger and less well-known people. The fact that people seem to be unable to formulate the problem cleanly within string theory is another sign. Not quite relevant to the present discussion, but I would like to notice that black holes are not necesserary very dense objects. In fact their density goes at the inverse square of their mass. You can calculate that the density of a black hole the size of the visible universe is roughly 10^(-29) g/cm3, in fact close to the density of our universe, and a very low density indeed ! There is a fascinating possibility that pour universe may be a black hole, and that we leave inside a gigantic black hole..
Notice that for the size of our visible universe, I took 10×10^9 light years. If you define a black hole as an object having an escape velocity > c, then the distance for which this is true = 2Gm/c^2 under GR (no rotation, no net charge, etc) just as you stated. And yes, if you have enough mass the black hole need NOT be very dense. And yes, if you plug in the numbers the ‘universe’ may be a black hole with an event horizon on the order of 10^27 m. I have read this many times in many different places, so I’m a little surprised by the reaction here. Where have you read it? I have never heard a professional refer to the density of a black hole. In a simple Schwarzschild black hole, things inside the black hole keep falling and falling until they hit the singularity. The black hole interior is actually mostly or completely empty of material, and the energy that looks like “mass” from the outside is stored in the gravitational fields, which are highly relativistic and not at all like ordinary material. But maybe I am unfamiliar with the way general relativists talk about it?? I’m not impressed; you notice there’s no discussion of the *dynamics* of such an object. Really, you should view this as the calculation of the MAXIMAL density that a stable, non-collapsing object of size r can possibly have; if its density is any larger, it inevitably collapses to form a black hole. You should NOT view this as the density of a black hole, because the stuff in the black hole never stops collapsing, and the black hole (unlike the sun) is not full of material out to its radius r; nor is its physical volume 4/3 pi r^3. So what you’ve learned is simply this: that for a very large object, the density of material needed to form a black hole is less than it is for a very small object. But this is NOT the density of a black hole. @Alain: Again, I’m not an expert on this, but it my understanding that this demonstration might have some issues in the logic. The density as a function is a derivative, and a function to be able to have its derivative determined at a given point must be continuous at that given point. In this case, density is the derivative (partial derivative) of the mass by the volume: it expresses how the mass of a given body varies as the volume of the body changes. Any black hole presents a singularity, not only at its center, but all around a certain distance of its center, so, the function is not continuous because it is not defined all around that distance from its center. @Alain: we could calculate the average density of the black hole with that formula, but it does not apply to determine the equation of the function of density, as it would be plagued by the singularity issue that I mentioned. Again, it is my understanding of the calculation. Due to the discontinuities, the density function would present a pulse-like change in its value, a Dirac delta functional. You make things more complex than they are. All mass of a black hole resides inside its swartzschild radius. So the calculus is straightforward. If you consider the black hole as a sphere, its density is simply M/V, no derivative, and no singularity inside to consider. V is the volume of a sphere, that is 4/3 PIx R^3. In “classical” General Relativity, black holes don’t evaporate, and if they are far from matter, they don’t “eat” matter either, so their mass is constant. It’s really misleading to think of a black hole as an object with a density. Sure, you can divide M by 4 Pi R^3; but the space inside a black hole is highly warped (so the volume isn’t that of a sphere in flat space) and the mass isn’t sitting still and filling the volume of a ball of radius R, the way material fills a planet like the Earth or a star like the sun. So your calculation really doesn’t correspond to anything physical. There are many formal reasons why we could argue that the mass of the black hole is completely concentrated at it center, that is, mass with zero radius, and one of such formal arguments is tidal forces: if the mass would have a radius larger than zero, if would be affected by incredible tidal forces, it would be violently stretched like play-do before it would collapse back to zero radius. Another point to consider is, as you cannot see inside the radius of schwatzschild of a black hole (by definition), the distribution of mass inside is irrelevant for an observer outside the horizon.So you can just imagine it is an homogeneous sphere. See my above comment. You can do that if you want, but it doesn’t tell you anything physical about the black hole itself. It’s much more physical in fact to consider the surface gravity of the black hole — its mass divided by its area. In fact that’s the whole point about black holes and their horizons (cf. “holography”). @Alain: I do not consider myself an expert on this matter, but it is my understanding that your arguments present conceptual errors that can be applied as a first approximation, but are not valid. In the late XVIII century, Reverend John Michell (a british amateur astronomer), using the equations of classical mechanics for the escape velocity, hypothesized how small should be a star like our Sun so that light could not escape its gravitational pull, and he came up with a value of a radius for such a star that is numerically identical to the Schwarzschild radius. Pierre Simon De Laplace, independently, found an indentical solution to Michell’s. It would make sense for either Michell or De Laplace to present assumptions like you propose, as all they knew was classical mechanics, but I’m not that certain that they properly describe the density function of a black hole, from the event horizon into the singularity, let alone the density around and at the singularity. But, again, since I’m not an expert, it’s not valid for me to determine whether or not your assumptions are valid. Developing a first approximation theory based on First Principles to gain some understanding of a complex problem and even to be able to make some predictions to feed this knowledge back into a more complete theory are very important steps in the evolution of science. We can argue that this is where we are standing now with these theories of black holes. Theories like QED and QCD are both directly related to how a star like our Sun behaves while it still have nuclear fuel to transform into energy, and it also is the very same Physics that is required to know to design thermonuclear bombs, so, the Cold War was very helpful in keeping a healthy and steady flow of cash to finance this research. Unfortunately, the Physics for black holes did not receive a major financial push from the Cold War, so, it is no wonder that we do not know as much about black holes, besides the fact that the problem in itself is particularly complex because it requires the proper coupling of two theories that are inconsistent which each other. Umm — I don’t think I agree. The real reason we don’t understand black holes is (a) we can’t do experiments on them, or observe their most subtle effects, and (b) they’re really hard to understand. That is a very good point, yes, we can’t make experiments directly on black holes. But also it is true that Einstein could not validate the equations of GR with new experiments, he based his theory on a great intuition, on previously known experiments, on first principles, and on how he imagined that his equations should “gracefully downgrade” to classical mechanics as a validation. He built in his mind an understanding of the physical interpretation of the properties of non euclidian geometries. Up to a point, we could argue that the physicists that have navigated the uncharted waters of black holes have used some amount of a similar kind of intuition, but maybe not as successfully as Einstein did: this problem is really of the “hard” type. It is proper to say that some of the russian physicists that worked on black hole theories indeed did also work at the same time developing weapons, but on the western side, almost all physicists involved in black hole theories were not financed by weapons at the time of their research on black holes. Robert Oppenheimer and John Wheeler did work on weapons programs and on black holes, but not at the same period of time. I remember reading (some years back) that the infalling observer would seem to arrive at a singularity in finite time. If I understood correctly, however, (from a reference frame?) outside the black hole, the effects of relativity would require that the infalling matter would be flattened in its direction of travel and time would pass more and more slowly, so that it would exist in the form of increasingly thin shells of falling matter which would never quite reach a singularity in finite time. If true, wouldn’t this mean that the information stays in its original form, in some sense, until evaporation? And for the infalling observer, wouldn’t this suggest that an evaporating horizon (whether event or apparent) would somehow “catch up” with the observer, before the observer could reach the singularity? Apologies for my ignorance, and I hope this question is even answerable in some form. 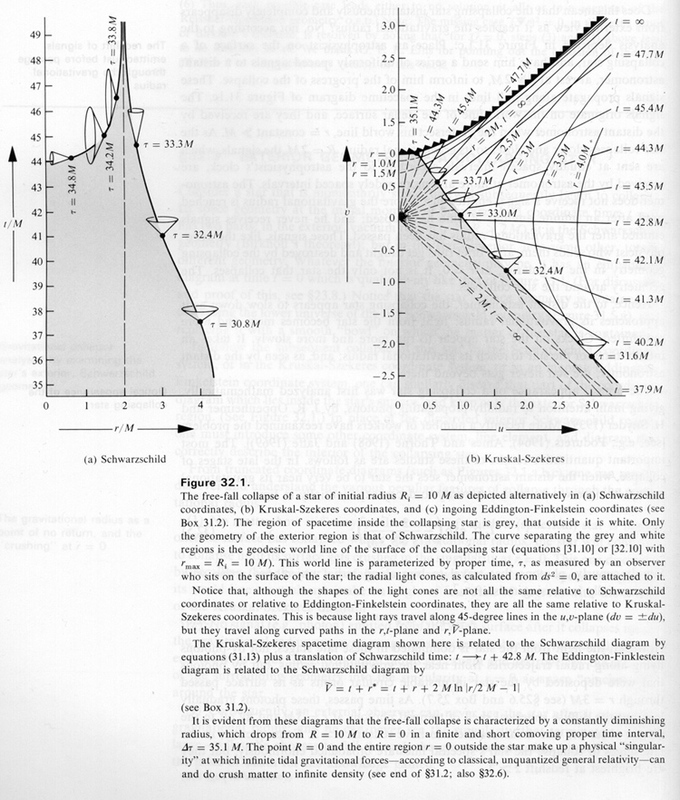 Whatever the case may be, it is good to put in mind that the Schwarzschild horizon of a black hole is not, in the words of Wheeler and Ciufolini(Gravitation and Inertia, 1995) “a true singularity, but just a coordinate singularity”. Also, the Hawking evaporation process does not affect in any important way black holes of about one solar mass or more. So what’s the fuss all about?? Would you be so kind as to write down the equations of General Relativity, the equations of the Standard Model, and Maxwell’s Equations? Although I do not expect to understand them, I would like to see them [and I suppose that it would also benefit some of your other readers]. In case, Matt does not get time to answer your question, here is a website of particle data group at Lawrence Berkeley Lab, which lists SM and GR and even Maxwell’s eqs. http://pdg.lbl.gov. Look at the review articles , not the particle data tables. Your tax money paid for this!!! Well, Maxwell Equations are relatively easy to grasp: only standard vector calculus is required(undergraduate level). Einstein Field Equations are tougher, as they require tensor calculus. But the Standard Model is really tough stuff: QFT. I admit I have never been that far…but it good to “see them”, as Ken says! Your reply above noted Matt. IMHO the only black-hole interpretation that makes sense is the original “frozen star” interpretation. Take a look at this page from MTW. On the Schwarzschild diagram on the left, follow the curve from right to left. An infalling observer goes up to the end of time and back and is in two places at once. This is “transformed away” using Kruskal-Szekeres coordinates as depicted on the right. But IMHO there’s an error: Kruskal-Szekeres coordinates effectively say a stopped observer sees a stopped clock ticking normally. IMHO that’s wrong. A stopped observer doesn’t see anything. Ever. Regarding the mass of stars and how that affects the collapse of the star at the end of its “regular” lifecycle (as a burning star), we should take into consideration the models and calculations of the Tolman–Oppenheimer–Volkoff limit (regarding stars collapsing into a black hole) and the Chandrasekhar limit (regarding stars collapsing into a neutron star). The models are so complex due to the physics involved, that it is considered a first approximation calculation, because there is uncertainty regarding what is the smallest mass of a star that would turn into a black hole after its collapse. It is my understanding that we can have a model of the density of a neutron star that is fairly accurate, as well as the fact that this calculation can be validated experimentally. Pertaining to the calculation of the density of a black hole, it is my understanding that the models for such a thing are much more complex to go beyond a first approximation kind of metrics. Pingback: No, Hawking Isn’t Saying There Are No Black Holes | Whiskey…Tango…Foxtrot?